Apple Watch is not just a conventional watch, it’s a watch with heaps of features and we are here to unclose those features to you. 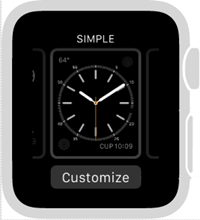 In this tutorial we are guiding you how to change the watch face of Apple Watch, it’s very simple to change the Apple watch face simple follow below steps and choose the watch face of your liking. Presently there are 10 built-in Apple Watch faces you can choose from but soon Apple will add new watch faces. Congratulations, you have successfully learned how to change watch face of an Apple Watch. If you don’t like any of the Pre-defined watch faces from apple, then wait for an update so apple may come up with new watch faces.